Moscow icon painter and public figure of the 17th century, Simon Ushakov, in 1671 wrote another icon of the Old Testament Trinity. The basis for the construction of the composition was taken by the original work by Andrei Rublev. The location in the center of the picture of the table, three angels sitting around it, the architectural structure in the upper left corner, the tree in the right, these elements are repeated, but the nature of their execution can even be called opposite. The Trinity of Ushakov sits against the backdrop of antique arches and columns, borrowed by the author from the paintings of Veronese. A large tree is devoid of the original iconographic symbolism. It is not ephemeral, but quite real – with a wide dark trunk and a weighty crown; in it the biblical tree of life is hardly guessed. The furniture in the painting is depicted with striking detail. There is a plethora of dishes on the white tablecloth of the table: silver and gold bowls, plates and glasses. Although the angels are shown in the folded dress traditional for the icons, their faces are depicted in a completely new style. This is a calm expression of the eyes, devoid of internal hidden emotions, detail and volume of the features. 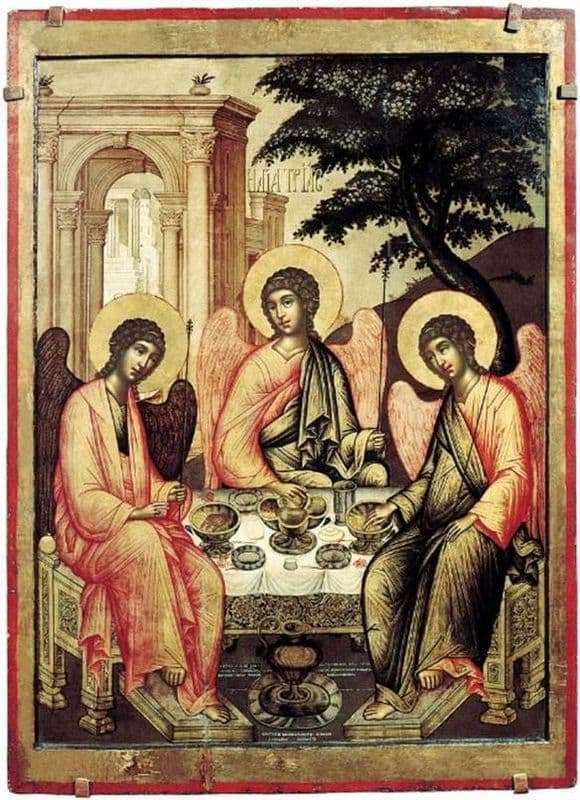 The wings of angels are also presented in astonishing realism, as if they were not heavenly creatures seated on a spiritual council, but earthly birds crouched at the table. This reflected the uniqueness of the icons of Ushakov – an attempt to combine the old rules of Russian icon painting and the new tendencies in European painting for that time. With the use of artistic means, Simon Ushakov brings the Old Testament trinity closer to ordinary people, making it more comprehensible, accessible, earthly. The author’s innovation is in the skillful construction of the perspective of antique buildings, the furniture also does not seem to be flat. In the icon of Ushakov, the former spiritual context is lost, but another aspect of the world is revealed – its material versatility and beauty.